I watched "Trust" last Saturday and liked it a lot: well directed with great performances, which to me is imperative when such a delicate subject is being portrayed. I took my sister with me because I thought it would be important for her to watch that movie and I think that parents, teenagers and even young adults should watch it, too. One thing about the movie that surprised me was the director, David Schwimmer: I do not know much of his work – except for “Friends” – and to me he handled “Trust” perfectly. I will definitely pay attention to his next projects – versatility is one quality I deeply admire in actors and directors. From versatile people to versatile recipes: these financiers are delicious and the perfect canvas for your imagination – I made them once with cherries and they worked really well with candied kumquats, too. Start by making the candied kumquats: using a small serrated knife, trim off the stem end of each kumquat and then cut into about 6mm (¼ in) slices. In a medium, heavy saucepan, combine the water, corn syrup and sugar over medium heat and heat, stirring just until the sugar dissolves. Raise the heat to medium-high and bring to a boil without stirring. Add the kumquat slices, reduce the heat to medium and simmer until the fruit is tender and the sugar syrup is syrupy, 15-25 minutes. Remove from the heat and transfer the mixture to a heatproof bowl. Set aside to cool completely. Candied kumquat slices can be kept in the syrup, in an airtight container in the fridge, for up to 1 month. When you are ready to bake the financiers, remove the kumquat slices from the syrup and place onto a cooling rack to dry for 2-3 hours. Now, the financiers: preheat the oven to 180°C/350°F. Lightly butter ten 1/3 cup (80ml) silicone molds or butter and flour muffin pans. Mix together the ground almonds, icing sugar, flour and salt. Stir in the egg whites until just combined. Add the vanilla seeds and extract. Stir in the melted butter. Pour the batter into prepared. Arrange 2-3 kumquat slices on top of each financier. Bake for 25-30 minutes or until risen and golden and a skewer inserted in the center comes out clean. Remove from the oven and leave in the pans for 5 minutes before turning out onto a wire rack to cool. Dust with icing sugar to serve; store in an airtight container. I am so in love with kumquats and you are the second person who tell me about financiers and kumquats. I'll definitely try them soon... maybe with a hint of pistachio! 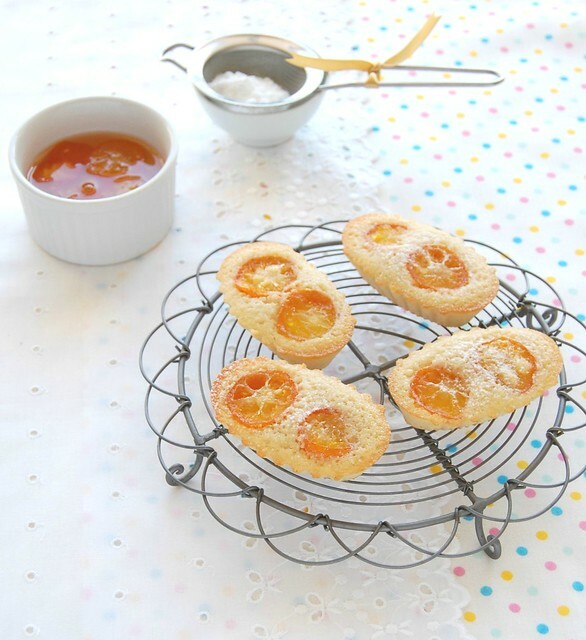 Candied kumquats in financiers, this catch my eyes and they are so lovely! :) Not to mention that your wire rack is so pretty and exquisite too! Looks really lovely! Nice photos:)! I love financiers, you give it a nice kick with adding kumquats ! the kumquats in the financiers look so great. great photography, love the pictures. I have only made financiers once...that must change! I have heard of the movie...looking forward to watching it soon. A cautionary tale in this cyber-age. i'm gonna bake some this week and let you know how mine were!